Our Northwest AR News ARCHIVES provide visitors to Buffalo River Log Cabins. com access to important sources of information and contact info for news and events in Arkansas and Missouri. For TODAY'S Northwest AR News, visit local Northwest AR News Paper Websites for Berryville, Clinton, Conway, Eureka Springs, Fairfield Bay, Fayetteville, Harrison, Heber Springs, Marshall and Mountain Home LISTED at the bottom of this page. Mountain Home, AR hosts a 25th Anniversary Quilt Show for quilters in the Buffalo River and Ozarks Mountain Lakes Regions. Around 300 quilts will be showcased at the Baxter County Fairgrounds on October 29 - 31, 2009. Tickets are $4 and children under 12 are FREE. Fabrics, sewing machines, patterns and quilting accessories will be available for sale. Plus a raffle for one special quilt! Visit hillandhollowquilters.com or call 870-425-1105 for more information and directions. Mountain Home with its surrounding lakes and rivers is just a pleasant short trip from Bear Creek Log Cabins. Turpentine Creek Wildlife Refuge, just South of Eureka Springs AR, hosts their 14th Annual Howl-O-Ween Spooktacular on October 31 from 7 - 9pm. This family-fun event takes place about an hour moonlit drive from our cabins in Buffalo River Country. Apple bobbing and other kid-friendly games, plus plenty of scary storytelling promise fun for all ages. A hayride in the dark past the big cat natural enclosures provides spine-tingling thrills as your guide spotlights the lions, tigers, cougars, bobcats and other Night Stalkers surrounding your hay wagon. Call 479-253-5841 for more information and directions. Known as Americas largest Veterans Day Celebration,the annual Veterans Homecoming in Branson MO lasts all week. November 5 - 11, 2009 downtown Branson rolls out the welcome mat for veterans and their families and friends. SAVE MONEY this year by staying at Bear Creek Log Cabins while attending the biggest American veterans party. Check out our Military DISCOUNT . Bear Creek Log Cabins is such an easy drive from Branson, Hollister, and Silver Dollar City the Branson locals love to come stay with us on their time off from all the shows. Bringing World War II history of the Midwest to the Midwest. Traveling Exhibit tells unknown story of German POWs held in camps all over the US. Roughly 372,000 German POWs held in U>S> Army-operated camps across the country were sent out to harvest crops, build roads, fell trees, lay city sewers and other tasks. Sponsored by the Searcy County Library and the Searcy County Veterans Memorial Association, the BUS-eum will be in Marshall,AR on October 10. Narrative panels and films will be available in the retrofitted school bus from 9:30am to 1:30 pm. Admission is FREE at the Searcy County National Guard Armory. Call Pat Halstead at 870-448-2420 for more information. Searcy County's First Annual FLYING JAM gets off the ground Saturday October 3, 2009 from 10 am to 6 pm in Marshall, AR. Admission is FREE and everyone is invited to come celebrate the County's Level 2 general aviation airport. Bring your lawn chairs and enjoy a family-friendly day of country music, good food, and amazing flying machines. Entertainment includes Country Music Bands, Gospel Singers, and Blue Grass Musicians. Lots of displays and tents and plenty of food concessions round out the day. Follow the signs from Highway 65 in Marshall, Arkansas. Call 870-404-1444 or 870-448-4488 for more information. September 24 - 26 wraps up the 2009 Northwest Arkansas District Fair. Harrison Roundup Club sponsors a PRCA-sanctioned Championship Rodeo each evening Thursday - Saturday to coincide with the Fair. Livestock shows and a Carnival of Amusement Rides round out the family-style country fun at this event just a short drive from Bear Creek Log Cabins. Annual Membership Meeting for the Buffalo National River Partners is open to everyone who appreciates the unique natural experience the Buffalo River provides. From 2 - 5 pm on Sunday, September 27 the BNR Partners group will meet at Tyler Bend Pavilion. They welcome anyone interested in protecting the River and promoting responsible use of the Park. BNR Partners hope to provide a way for folks to work together to improve visitor experiences and preserve the unique natural and cultural features of the Buffalo National River. Whether you love this amazing riverway for fishing, canoeing, hiking, camping, nature study or Ozarks history - they'd like to meet you and welcome you to join them. Call 870-365-2881 or visit www.bnrpartners.org for more information. Harrison is only about a half hour drive north of Bear Creek Log Cabins. We specialize in family reunions for Ozark Mountains families. Boone County AND Searcy County Libraries offer lots of archives and experienced help for folks researching their family histories. We are located close to BOTH these great geneology centers. AETN public television will feature winning photographs in three age categories on AETN Sept. 27 to celebrate The National Parks: America’s Best Idea program launch. To be eligible for a prize, photos must be taken in an Arkansas state or national park from June 1, 2009, to Sept. 23, 2009. Photos should highlight nature, wildlife or unique park activities. All entries must be submitted online. Visit www.aetn.org/parks/photocontest for more information or to enter the contest. 36th Annual Autumn Daze Arts & Crafts Festival in Historic Downtown Branson coming up soon. More than 150 crafters and artists from all over the USA are expected. Traditional country crafts like quilts, crochet, wood toys, collectible dolls, ironwork and more will be displayed for sale. Free admission and entertainment all weekend long September 17-20, 2009 in downtown Branson, MO. Contact Downtown Branson Main Street Association at 417-334-1548 for more information. Remember, it's just a pleasant scenic drive up Highway 65 to Branson from Bear Creek Log Cabins. Junior Ranger Program, The Buffalo River Relay, winds up the 2009 Summer Season at the Buffalo National River Park Visitor Center. 9:00 AM, Sunday, September 6 marks the final summer program at Tyler Bend Campground. Become a Junior Ranger! Join the park ranger and learn about things to see and do at the Buffalo River. Test your skills on the Buffalo River relay obstacle course. All programs are free of charge and open to everyone. Formal closure of the opportunity for individuals to help guide the Park Service in writing its new General Management Practices for the Buffalo National River closes on August 31, 2009. Park Superintendent, Kevin Cheri, reminds everyone that "Comments are welcome at any time, although comments received by August 31, 2009 will be most helpful." Cheri also stressed that the more specific people are in presenting their suggestions and ideas, the more helpful they will be to the planning process. Don't miss this chance to influence what happens to the Buffalo River over the next 20 years. Friday August 28, at 8 PM a Park Interpreter offers an hour slideshow at the Tyler Bend Amphitheatre. Healthy Karst = Healthy Caves = Healthy Park presents an in depth understanding of the over 300 mapped caves inside the Buffalo National River Park. The unique Karst geology of the area is a prime reason the Bufflo was chosen as America's first national river. AR Game & Fish is looking for feedback from hunters as they begin the process of setting the 2010 spring turkey hunting regulations. Eleven public meetings held around the state Aug. 25 from 7 p.m. to 9 p.m. will give turkey hunters their chance to have a voice in the Arkansas Game and Fish Commission annual regulations process. 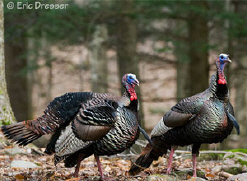 If you’re not able to attend one of these meetings, you have until Sept. 30, 2009 to comment online at www.agfc.com, or by phone at (800) 364-GAME (4263) or mail your comments to AGFC, Attn: Spring Turkey Regulations, 2 Natural Resources Dr., Little Rock, AR 72205. On Friday, September 11 through Sunday, September 13, Harrison hosts the 2009 Arkansas Hot Air Balloon State Championship Race. Balloonists from around the Ozarks and beyond will converge over Harrison to compete for the Arkansas State Hot Air Balloon title. Balloon target and steering competitions, balloon races, balloon rides for the public, and night-time balloon glows are usually included in this annual regional event. Sponsored by Harrison Chamber of Commerce, events will center around Harrison Jr. High School Football Field. Call 870-741-2659 for more details. Harrison is only about 1/2 hour North of Bear Creek Log Cabins on Highway 65. Bull Shoals State Park visitor center is the closest location for Buffalo River archers to take the International Bowhunter Education Course. Arkansas Game & Fish Commission will issue graduates a bowhunter education card. This card is meets requirements for the AR urban bowhunt program and is good for life. Aug. 15, 8 a.m. to 5 p.m.
but hunters MUST register CONTACT: tom@monticellonews.net OR CALL (870) 818-2704 and leave message with name, phone number and class date. A follow-up Field Day will be required on Sept. 12, 8 a.m. to 12 noon at Bull Shoals Archery Range. Treestand safety, blood trailing, and other bowhunting safe practices will be covered. Bull Shoals is just a short, scenic drive from Bear Creek Log Cabins. Our facilities offer bowhunters of all ages an excellent location to practice their hunting skills. Clinton AR, on Hwy 65, is home to world-famous Chuckwagon Race each Labor Day Week-End. About 150 teams compete in 5 Divisions - making this the ultimate in Cowboy Action events. 20,000 people are expected in 2009 for the chuckwagon racing event and the Snowy River Race that ends with a plunge into a river! Gates actually open the Saturday before (August 29) and there will be lots going on all week. Admission during the pre-race events is Adults $15 per day and Children $7.50 per day. Bronc fanning, four different Ozark mountain trail rides, a mule clinic, horseshoeing, cattle drives, a Battle of the Bands, chuckwagon BBQ, and a Western Trade Show, are all part of the fun. Paul Morrell from Louisiana will answer questions and address problems riders may have with gaited horses in a special gaited horse clinic. For more information, call 501-745-5250 or 501-745-8407. All this excitement is just a short, scenic drive south of Bear Creek Log Cabins. $1.2 million of economic stimulus money will help repair trails and other facilities in the Buffalo National River Park. Work began earlier this summer and is expected to continue over the next two years. Ice damaged park buildings, along with flood-damaged roads, trails and retaining walls at several riverside locations are the major focus for repairs. Access to Tyler Bend and Buffalo Point is being improved. Group Pavilion roof repair is a high priority as well. Work on the Buffalo River Trail, the Lost Valley Trail and the trails in the Compton area along the upper river began as quickly as possible once the stimulus funds were released. All of these home town Northwest AR news papers carry calendars of local events. No matter when you vacation at Bear Creek Log Cabins, you'll find lots of family-friendly activities.